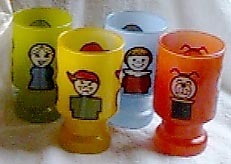 Description: Four different juice glasses were made sometime during the late 1970's or during the1980's featuring Original Little People figures. We are not sure what company produced these juice glasses and we are not sure how they were distributed. They may have been some type of promotional item? All we know is that they are very hard to find and they make a terrific addition to a Fisher-Price collection. FPT4006 - Red frosted juice glass with 4 pictures of a straight-sided Little People Lucky dog with yellow collar around the glass. Measures about 4" tall. FPT8605 - This glass was sold in a clear plastic storage bag with 3 other Little People family members. The bag has a cardboard divider and holds 4 Little People family juice glasses.